On Crete, the choice of accommodations is as diverse as anywhere in Europe. One thing that differentiates Greece’s biggest island is the amazing choice of best stays here for the asking. With alternative touristic delight in mind, here’s a selection of five of the most interesting properties we’ve found so far. These are accommodations you may not find in the cluttered search and marketing puzzle that tourism has become. Our editors met VanGos Tsourlakis back in 2015 while searching for an authentic Cretan experience during their first visit to the island. Tsourlakis, a noted architect, and entrepreneur on the island had just completed rebuilding a fabulous old olive mill into an amazing countryside villa. 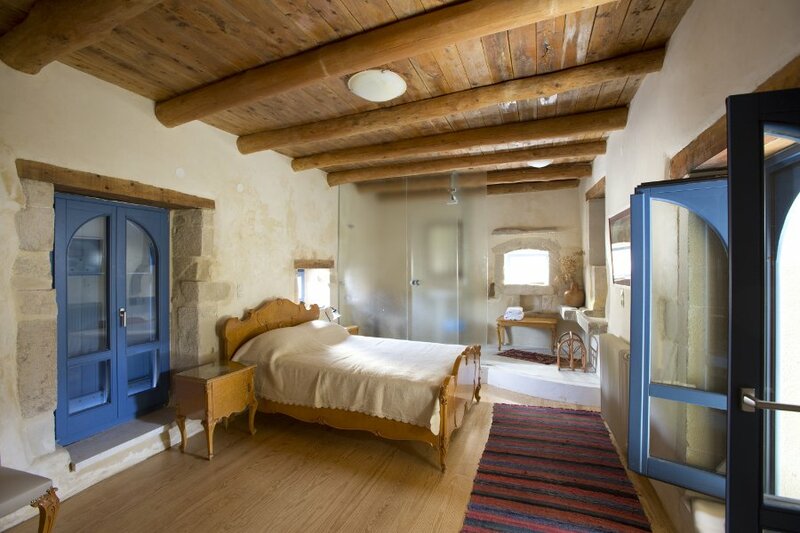 His Grotto Homes Venetian Mill Villa, which is billed as an alternative luxury on Crete, is all that and much more. Situated in the out of the way village of Goulediana, the Venetian Mill emits the joy of its creator through traditional Cretan antique furnishings down to the complimentary raki the host greets each guest with. The villa is transformative in many respects, not the least of which is a kind of reverence the place exudes. Here, in a fabulous place where luxury meets nature, the Airbnb super-host VanGos has fashioned a kind of time portal into the beautiful culture beneath Crete’s rugged exterior. 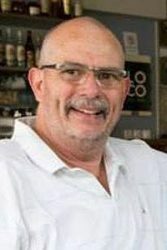 Our founders tried to convey the essence of this place in a series of articles from 2014, but the fact Tsourlakis’ holiday rental is booked solid says it all. The villa can accommodate up to 11 people (7 in beds and 4 in sofabeds) in an opulent but relaxed atmosphere. The indoor grotto pool is a special feature, but the outdoor pool and tailored grounds capitalize one of Crete’s most amazing vacation homes. Readers can book the Venetian Mill via Airbnb here or at the villa website here. Crete accommodations with a view or commonplace on Crete. This is true largely because of the vertical nature of the island. Vistas are common where the mountains meet the sea, to be sure. However, finding the right combination of value and view combined with solitude and traditional Cretan experiences is not as common. 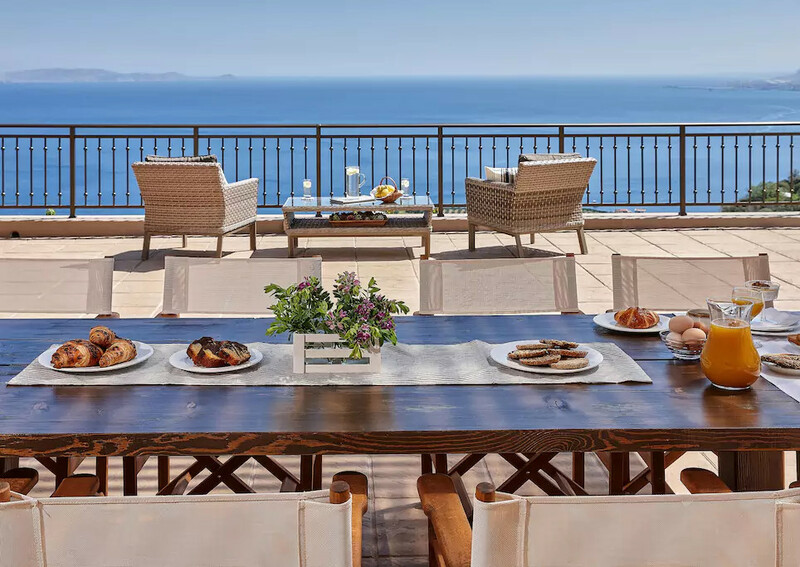 Villa Omikron overlooking Heraklion and the Sea beyond is that rare combination. This four bedroom, three and a half bath luxury villa boasts of a magnificent pool with an unbelievable overlook, as well as numerous other 5-star features. We suggest you check out the villa’s photo gallery to really get a preview. Owner Dimitris Markakis’ fabulous home is located in the historic and picturesque village of Rodia just 18 kilometers from Crete’s capital. Surrounded by pristine countryside and nature, the villa cohabitates with the village charming cafes and taverns, as well as the old church of Panagia of Rogdia. The list of surrounding attractions and points of interest is too extensive for telling here, but guests are always impressed by the multitude of local treasures like nearby Spiliotissa Gorge, Agia Pelagia Bay, the Savvathiana Monastery, the beach at Pantanassa, and many more. Readers can find out more and book Villa Omikron via Airbnb here, or via Markakis’ SeaScape Luxury Residences site here. I’ve begun cataloging Kokkinos Pyrgos and the other seaside treasures of the south coast, but take my word – the quote above is abundantly true staring out at this unbelievable gulf. This place is really a “best stay” for melting away stress. 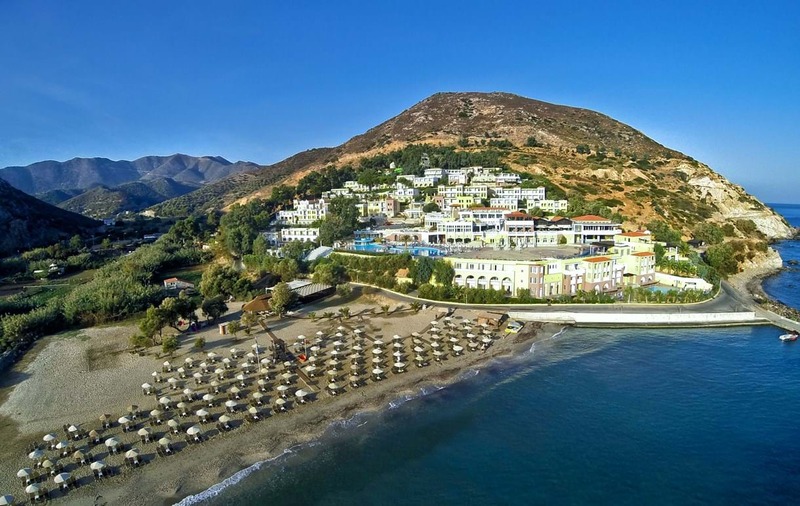 For those unfamiliar, Kokkinos Pyrgos is a small beach resort in the south of Crete, situated in between Matala (15 kilometers further south) and Agia Galini (10 kilometers west). The town is right after the big village of Timbaki, on the road toward the famous Minoan palace at Phaistos toward Heraklion. For more information about rates and staying at the house please visit the website or phone +30 697 332 4510. I love Fodele Beach. We go there in the offseason a lot just to breathe in the calm solitude and peace of the place. The little rundown 60s beachfront spots on the east end of the beach create a kind of retro character to the place. Then up high on the hill overlooking one of the island’s most underrated all-inclusive resorts stands watch over this perfect little bay. Known officially as the Fodele Beach & Water Park Holiday Resort, this hillside resort is an airy and majestic hotel with all the usual exclusive suspects to please. Flat screen TVs to private balconies and terraces overlooking the Cretan Sea, the hotel features 3 restaurants, 3 snack bars, and a lounge. By the pool, there’s another class bar, and on the perfect sandy beach, there’s another chic watering hole. After living here almost a year now, and having written as much about Crete as anybody, the scope of this island is finally sinking in. Tourism-wise I don’t think there is any place with the same mix of sightseeing and activity diversity and value for visitors. That said, it’s logical that there are more great accommodations here than you can shake a stick at. Five-star all-inclusive wonders, themed stays, magnificent villas or houses, I guess I’ll never reach the end of Crete hospitality. That’s why I was not surprised to find Koutsounari Traditional Cottages in southeast Crete in between Ierapetra and Agia Fotia Beach. Situated on a hill overlooking the Libyan Sea, this best stay experience is surrounded by Cretan nature. A plush garden and olives groves hold the picturesque cottages in their grasp, and wild bougainvilleas and innumerable herbs provide a magical fragrant and visual perspective. The traditional architecture adds to the overall feeling of belonging here. 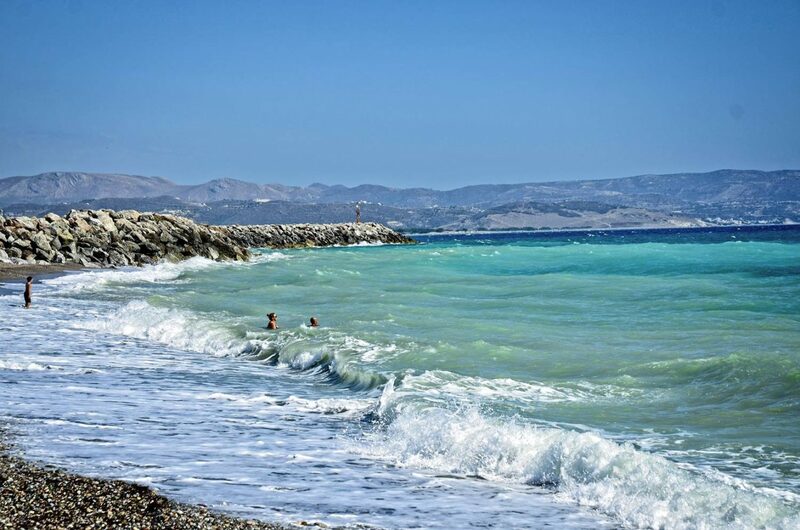 It’s a certainty you’ll find Koutsounari, near Ierapetra and idyllic experience.